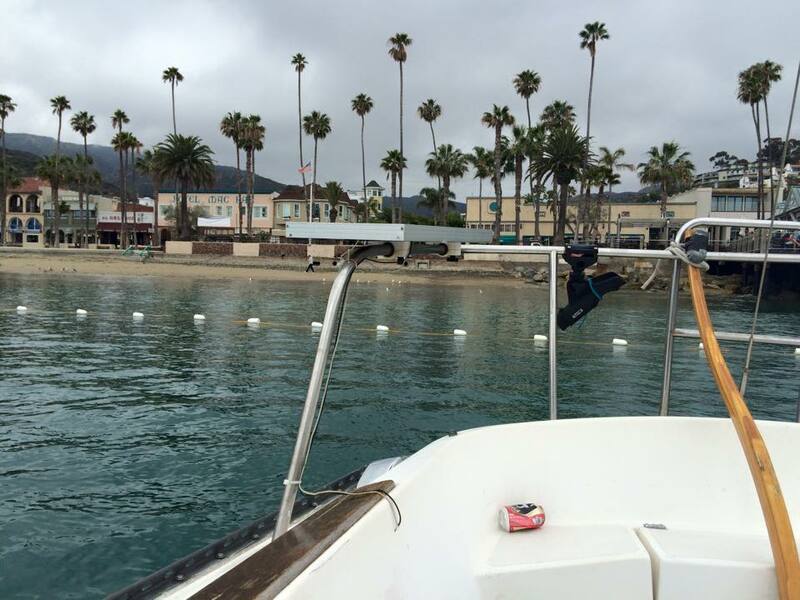 Jessica and I just arrived in Avalon Harbor on the beautiful Catalina Island. We're lucky enough to come out here on the tail end of Memorial Weekend. This way we get a heavy dose of people watching and then we can lean back in the cockpit and watch as the town empties out. We had a smooth crossing: bright skies and warm air. I was hoping the wind would pick up and we could sail in the second half. But, as wind is a fickle creature and cares not for my concerns, when the wind did arrive - it arrived square on the nose. This did nothing for our speed over ground, knocking us down under 3 knots/hr. But on the positive note, my tiller-pilot performed like a champ. This contraption is now 10 years old and can still hold a heading. It is just a mechanical arm, that pushes the wooden tiller around. This brand is called AutoHelm. This leaves the captain free to patrol the main cabin and pour himself a drink. If you want to install a proper windvane, reach out to WindPilot, they make the proper equipment. 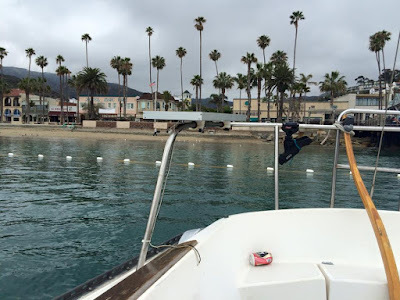 I asked the friendly harbormaster at Avalon to get us nice and close to the shore. The water is calmer up there and the people watching is high quality. He did abide. He brought us in to 9 feet of depth, which is about as shallow as I would ever want to be moored with my 6 foot draw. But,as expected the people watching was super entertaining. First off, there was a rocking concert Sunday evening as we motored in. But, more importantly, we noticed the town buzzing with tons of workers in blue jackets on the following Monday morning. Bud Light and Catalina Island collide...should be interesting. What were all these workers bees doing? Why they were erecting a giant Bud Light statue on the main drag? Well, because Avalon has been chosen to be the next American town re-branded and taken over by Anheuser Busch for their new 'Down for whatever' campaign. This means on the following weekend - Avalon will be converted into a fictional place called, 'Whatever, USA'. The giant Bud Light statue is erected in Avalon. 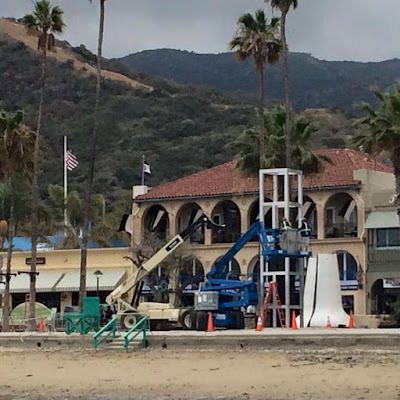 Town of Avalon on Catalina Island is about to become Whatever, USA. Apparently, this happened last year in Crested Butte and it raised a half million in cash for the town (and pissed off the locals). A local in Avalon mentioned to me that this year Avalon is planning to have their town sports field refitted with AstroTurf for about half a million -with Bud cutting the check. This is actually a very good way to use the money, since the town is on 25% water reduction and watering the field is a massive drain of the town reservoir. All the bars have to only serve Bud Light and the town will probably be painted Bud Light blue. Also, about 1000 Bud Light party people will be dropped into the town - in order to create the perfect Bud party. Another rumor is that Snoop Dog will be there to serve hot dogs. Either way, there will be dancing, electronic music and #millennial madness. 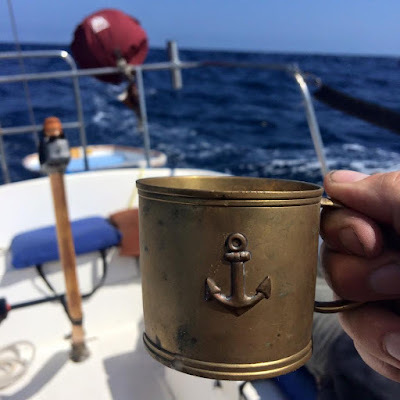 Even though I know we should just leave it alone and keep to our sailboat, there is a very good chance we will be stopping by Avalon on the way home. I don't imagine we are invited to this party, but that probably won't stop us from trying to get in. Whatever, USA is sure to be a debacle, but I am quite sure it will be an entertaining debacle. That said, I do anticipate all the salty locals will be shaking their heads and cursing from the barstools at the Marlin Club. Of course, that will also be part of the entertainment.